The Models DC438 and DC436 12-bit digitizers set new standards in cost-effective CompactPCI-based high-resolution data acquisition by using the latest SiGe (silicon-germanium) technology. The Model DC438 digitizer features two input channels with fast sample rates up to 200 MS/s and wide bandwidth of 100 MHz. The Model DC436 uses the same SiGe technology and overall architecture as the DC438 and it has sampling rates of up to 100 MS/s and 50 MHz bandwidth. 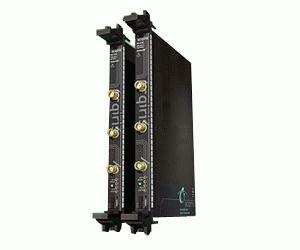 Both units have long 4 Mpoint acquisition memories, while the DC438 also has a selectable 35 MHz bandwidth fi lter. The DC438 and DC436 12-bit digitizers have their own crystal-controlled precision time base (better than ±2 ppm). Sampling rates can be chosen among a discrete number of values that cover the full range between 100 S/s up to 200 MS/s (100 MS/s for the DC436). The DC438 and DC436 flexibility in terms of sample rate selection and bandwidth combine to allow the high-resolution capture of signals up to 100 MHz (50 MHz) with a high spurious-free dynamic range (SFDR > 75 dB) and a high signal-to-noise ratio (SNR > 62 dB).